The Raspberry Pi mother board has one major problem with i2s audio interface. The clocks coming from CPU can only output one frequency clock perfect, resulting in major problems with audio files sampled at 44khz and multiple. Too much jitter on i2s clocks. So we enter the master mode for i2s. Instead of the RPi giving the clock on the line, the DAC itself sends the clocks and RPi sends the data (file tobe played). Since we used 2 clocks the problem above solved. RPI-HIFI-DAC is unique, because of the way we have implemented the design. First we separated the power on 3 channels and filter it: one for the digital side, the second for analog and third for the clocks themselves. We use some of the good brand LDOs on the market. In addition, we used two oscillators with very low jitter for clock units. Finally, on the analog stage we are using a film capacitor (not ceramic) for a quiet DC to feed the TI IC to reduce signal distortion. Dedicated 384kHz/32bit high-quality DAC PCM5122 for best sound quality. Audio output connectors: 2x RCA (LEFT &Right) &3.5mm head phone Jack. With 138mw headphone Amplifier can directly drive headphone. Work status indicators facilitate the understanding of the system working status. DAC SNR is 112Db . DAC THD+N @ -1 dBFS -78dB. Full Scale Output of DAC is 2.1Vrms. Ultra-low noise voltage regulators for optimal audio performance. Reserve EEPROM pin position to weld your EEPROM by yourself. Automatically switching frequencies according to the input I2S signals. Dual low jitter crystal oscillators for Master Clock generation. Infrared remote control connector (using GPIO26). DAC output coupled with Film capacitor . 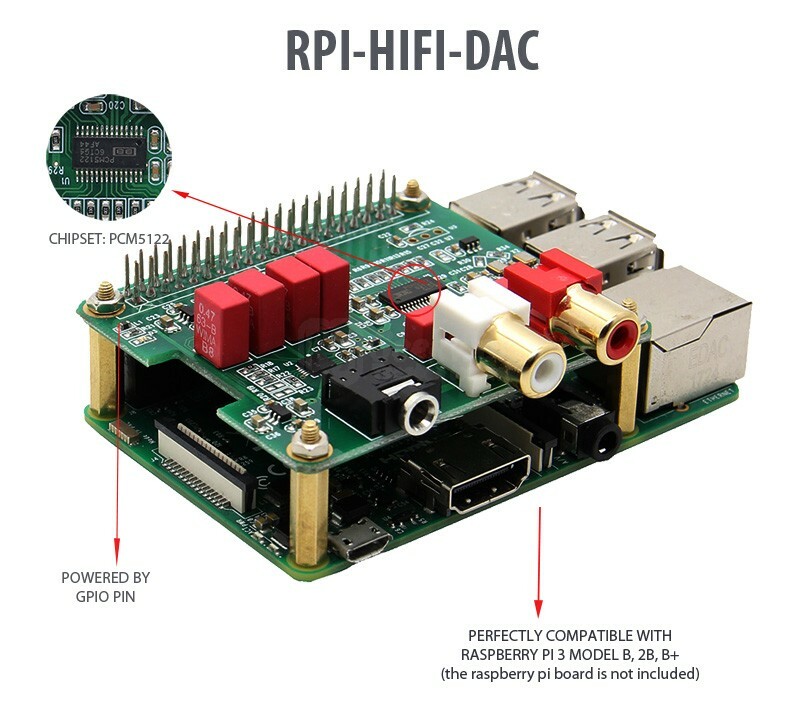 Connect the RPI-HIFI-DAC module and RPI with 40 pin connector .While installing the module, please pay attention to align the first leg of the raspberry pi and RPI-HIFI-DAC module. ​Notice: This RPI-HIFI-DAC Module is compatible with the 2018 new version Raspberry Pi 3 Model B+. ​ Notice: the raspberry pi 3 board is not included in the packing list.